Established in 1967 by Harry Weitz, UCAN FASTENING PRODUCTS has been supplying high quality masonry and metal fasteners to the construction industry for over 50 years. With his extensive technical background in construction and architecture, Harry has always possessed a keen interest in fastener design, function and application. Starting out as a wholesale distributor of innovative fastening products, made in the USA and Europe, UCAN was instrumental in bringing wedge anchors, concrete screws and galvanized spiral nail anchors to the Canadian market in the 1950s and 60s. Harry personally developed the EP932 tie wire anchor, which reduced installation time by 50%, as well as UCAN SCRU-IT®’s unique and efficient scalloped cutting thread. These fasteners gained immediate success in the marketplace. From its’ humble beginnings in part of a cramped warehouse, UCAN currently operates from an efficient 35,000 sq ft facility in Toronto. UCAN’s tight knit team of experienced, caring and knowledgeable outside and inside employees, provide an unrivalled level of customer service. Most orders are shipped the day they are received and order fi ll rates generally exceed 97%. Also key to UCAN’s success is the company’s philosophy of constant product improvement through R & D and strict quality control at all stages of production. UCAN remains a family owned business. While still involved at UCAN, Harry has passed the reins of the daily operation to his son, Jeremy who has been working at UCAN for over 28 years. 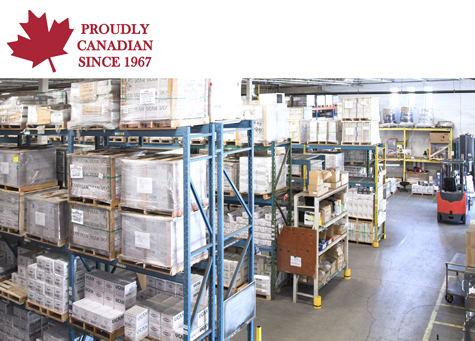 UCAN keeps its Toronto warehouse well stocked with over 1,100 stock types and sizes of anchors and accessories. As a result, over 97% of all regular orders are usually filled from inventory and shipped within 3-6 hours of being placed. Our technical staff and knowledgeable inside and outside sales people are readily available to provide technical assistance, product support, and field tests when required. Through a constant program of R & D, UCAN develops and improves products to meet the genuine needs of designers and contractors. UCAN products are made to the highest quality standards. Each production batch is strictly quality-controlled to assure consistent performance. UCAN is especially well equipped to supply many types of application specific anchors. Custom sizes and protective coatings are available to meet design requirements. UCAN FASTENING PRODUCTS provides steel and alloy anchors made to our specifications and available throughout Canada. Although companies cannot be LEED certified, UCAN makes every effort to minimize the environmental impact of our operation. UCAN fasteners can contribute to credits under LEED for new construction. Our various manufacturing facilities rely on domestic steel sources using the maximum available recycled material. Similarly, plastic parts are produced from post-consumer material, when possible. In addition, cardboard boxes and cartons are made from recycled paper. However, in each instance, it is impossible to determine the exact % content of such material. LEED assumes that any steel product has a post-consumer recycled content of 25%. FLOROK adhesive anchors contain low to no VOCs. UCAN Fastening Products is a division of British Fastening Systems Limited.